Please welcome Rajan Khanna to The Qwillery as part of the 2014 Debut Author Challenge Guest Blogs. 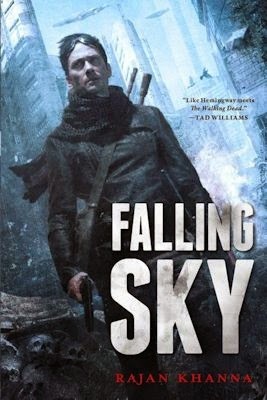 Falling Sky was published on October 7th by Pyr. You may read an interview with Rajan here. Creating a post-apocalyptic world has its pros and cons. Setting a work in the future gives you the freedom of taking the world down a specific path without fear of contradiction. At the same time it has to work off of established rules. It's unlikely that you can have working electricity, for example, unless you can explain why. If society has collapsed and the infrastructure to support power plants has gone with it, you'll be hard pressed to explain how people can have working light bulbs and appliances. It becomes a careful balancing act between what is and what might be. The first, most essential piece, is to define the apocalyptic event. When I was growing up the flavor du jour was a post-nuclear world with radiation and mutants as popularized in the Mad Max movies or the Fallout games. As the fear of nuclear war has faded, that flavor has changed. Today we're more likely to see worlds that result from pandemics, as current events shape our fears. Part of the original concept that sparked the world of Falling Sky was that I wanted the ground to be dangerous. I wanted it to be avoided if at all possible. Radiation could have worked, I suppose, but a disease felt more fitting to me. Disease not only threatened the survivors, it created more threats. The pandemic I created regressed the infected into animal-like creatures – savage, bestial, and always hungry. Unlike zombies, these are living, breathing creatures – fast moving, with the ability to breed and spread all on their own. The disease is now doubly-threatening – it destroys its victims’ identities while turning them into violent and dangerous creatures with the ability to infect others. The disease, of course, raised its own world-building issues – how would it be transmitted, what was its mechanism, how could it affect so much of the population? Airborne transmission would have been too much. I needed something that was dangerous but which could be avoided. As with some of the best fictional ideas, I pulled from the real world, from real diseases. Like HIV or Ebola, I decided that my virus would be transmitted through bodily fluids. Unlike those diseases, however, to make it truly earth-shattering, I decided it needed to be able to survive for long periods of time. HIV can’t really survive if exposed to air. My disease can, for minutes even. So if a drop of blood from an infected individual flew through the air and into your mouth, well, you’re done. If that blood hit your forehead and then dripped into your eye, same story. I’m not a microbiologist, so I don’t know the exact likelihood of such a virus, but it seemed within the realm of possibility. So it became a world where survival takes a variety of forms. On a general level, people go about their lives covered as much as possible. Exposed skin means the risk of an open wound that can be infected. Eyes and mouths need to be covered. So people wear hats and scarves and masks and goggles. They minimize contact with other people. They fear physical intimacy. Because the disease can take days to fully express itself, it’s difficult to tell who’s infected and who isn’t. Humanity then faces extinction on two fronts – from the disease itself, and from the lack of reproduction that it inspires. The other major method of survival is to stay off of the ground. That’s where the Ferals, the infected, live. So you have a group of survivors who live on airships or in floating cities. Places where the Ferals can’t get. Of course making that work involved some world-building as well. It was easy to envision a world in the near future where fuel costs had become so prohibitive that other methods of transport had to be relied upon. We’re practically there now. Modern airships are being tested as we speak, for cargo, passenger transport, and even surveillance. In my world of the future, airships became the predominant means of transportation, taking up the role of planes and ships, if not outright replacing them. When the apocalypse happened, people flocked to these vehicles to take themselves to safety. Airships still require fuel, of course, but here the speculative nature of the world came into play. These airships are designed for biofuels and rely partly on solar power. Helium would be a problem, but hydrogen, flammable thought it is, is much more easily produced. It wasn’t hard to imagine a world where these ships could continue to fly for generations. Of course food doesn’t grow in the sky. Neither do any other supplies, so to make this kind of system work, you would need people to go down to the ground, to forage for supplies and food and whatever they could find from the old world. The economy would become one of barter, with people trading for what they need. Ben, my main character, became one of those foragers, someone who spent most of his time in the sky, but made a living by going down to the ground to pick among the remains of the past. In the end, it all came together for me. The world came alive. A dangerous world full of scared, isolated people, forced to interact to continue to survive. Of course in a world like that, there would be those who would take advantage of those conditions to take more for themselves. But there would also be those, like Miranda, another of my characters, who would try to build something for the future. Who would organize to help heal the world in whatever way she could. All of these considerations went into the creation of Falling Sky. I’m proud of what came out, and feel that it’s rich enough for me to base future stories in the world. I hope that readers find the world compelling enough to visit it along with me. Ben Gold lives in dangerous times. Two generations ago, a virulent disease turned the population of most of North America into little more than beasts called Ferals. Some of those who survived took to the air, scratching out a living on airships and dirigibles soaring over the dangerous ground. Ben has his own airship, a family heirloom, and has signed up to help a group of scientists looking for a cure. But that's not as easy as it sounds, especially with a power-hungry air city looking to raid any nearby settlements. To make matters worse, his airship, the only home he's ever known, is stolen. Ben must try to survive on the ground while trying to get his ship back. This brings him to Gastown, a city in the air recently conquered by belligerent and expansionist pirates. When events turn deadly, Ben must decide what really matters-whether to risk it all on a desperate chance for a better future or to truly remain on his own. Rajan Khanna is a graduate of the 2008 Clarion West Writers Workshop and a member of a New York-based writing group called Altered Fluid. 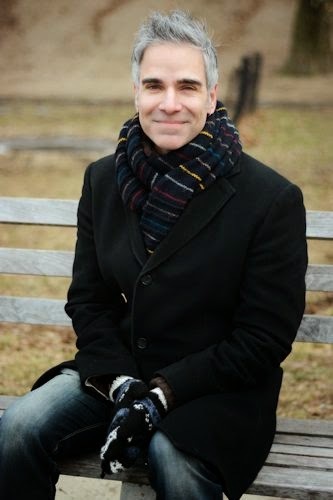 His fiction has appeared or is forthcoming in Beneath Ceaseless Skies, Shimmer magazine, GUD, and several anthologies, and has received Honorable Mention in the Year’s Best Fantasy & Horror and the Year’s Best Science Fiction. He writes for Tor.com and LitReactor.com and his podcast narrations have appeared on sites such as Wired.com, Lightspeed magazine, Escape Pod, Podcastle, and Beneath Ceaseless Skies. Rajan also writes about wine, beer, and spirits at FermentedAdventures.com. He currently lives in New York. Feature: Westmarch Publishing Book Giveaway!